On Monday, the Sun will leave airy Aquarius for the seas of watery Pisces, joining Mercury, Mars, Chiron and Neptune. In fact the first thing the Sun will do is conjoin Neptune in Pisces on 20 February, loosening boundaries between what is and what might be. There will a minimum of five planets in water signs for the next month, creating a fluid, ever changing atmosphere. Last year at this time Saturn was still in Libra so this is the first time when the Sun travels through Pisces with the solid support of Saturn in Scorpio. It is my feeling this may turn out to be very beneficial because Saturn can provide much needed structure for very mutable Pisces. 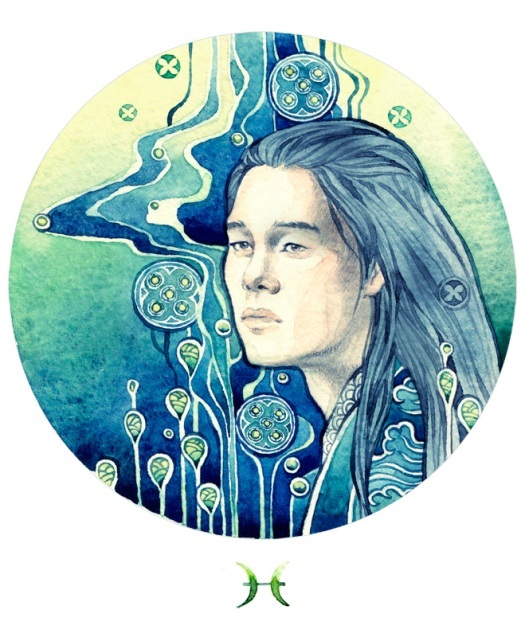 In watery Scorpio Saturn is harmoniously trine to Pisces, a gently supportive aspect. We have getting a preview of this tomorrow when Mars in Pisces is trine Saturn. Pluto in Capricorn is another powerful entity providing serious backup for Pisces. This is enhanced by the ongoing Saturn-Pluto sextile/mutual reception. Those who have personal planets and Ascendant at 11° in Pisces should notice increased resolve and a willingness to tackle the tough issues. I almost hate to mention the upcoming Mercury retrograde in Pisces from 23 February to 17 March. Thankfully Mercury doesn’t make it back to conjoin Neptune again . . . once was enough. It remains to be seen how much difference having Saturn and Pluto aspecting this spacey Mercury will make. Sure can’t hurt! A rather odd issue I associate with Pisces (and with Moon-Neptune aspects) is being emotionally unavailable. I believe this has to do with the fact Pisces, like Capricorn and Aquarius, is one of the signs that represent the collective. There is a big difference between being kind and loving to many people and doing the same in a one-on-one relationship. It can take the shine off your love affair when you realize your Pisces lover interacts with other people with as much warmth and compassion as they show you. Neptune has no boundaries and its compassion has no limits, something easier to see as wonderful in the abstract. Perhaps for Pisces, it is indeed easier to love many than just one . . . not to mention far less stressful. Does this resonate with those of you who have Sun, Moon or Venus in Pisces (or those planets aspecting Neptune)? Actually, no, that doesn’t resonate with me, neith. For once. (cuz you usually hit the nail on the head.) I find it much easier to love one than many. I just have to watch losing the boundaries, cuz Pisces wants to MERGE. Although I can be a chatterbox when I’m comfortable with people, I need space away from them a LOT. I need weekends with no structure except that which I set myself. I need to be able to not get out of my pajamas for days on end. Puttering around with myself is like a vacation. And, since I’ve loved (ahem) lots of other Pisces before, I can say that they were mostly same way. They ALL preferred the one to the many. When they were acting compassionate towards others, it was a way of distancing people, not reaching out towards them. And they all needed the alone time. Except for the ones who were afraid to be alone. But that was a very small minority. In a way, it reminds me of that old Star Trek episode where the empath had to learn to heal without killing herself. Pisces distance because they tend to be one big flayed nerve when around people. Well, maybe you’re right in one way…I think Pisces needs serial monogamy. One person at a time but many over time. Anyway, that’s the way this Pisces Sun, Pisces Venus, Pisces Chiron sees it. Or maybe I’m seeing it through the Scorpio Moon/Mars filter. They ALL preferred the one to the many. When they were acting compassionate towards others, it was a way of distancing people, not reaching out towards them. And they all needed the alone time. Yes Diane, that resonates with me (my natal moon is in 12th house (Aries, however! )My Scorp suffers terribly with this, but I have to say that with Mars in Pisces and the current help of Saturn and Pluto I am learning to channel this love much more exclusively to him. The results so far have been very rewarding. I have a natal sun in 8th house Capricorn and Saturn and Pluto are providing a beautiful structure with which to transform those hurt, vulnerable emotions between us into something more intimate,deeply rewarding and hopefully long-lasting. I have a friend who has Venus in Pisces in the 7th house which in her case, she has Pisces on the cusp of the 7th. I asked her if she ever had a relationship with a man who she put on a pedestal and worshiped (to a fault). She looked at me in amazement and said, ” Years ago, I had a long term relationship with my Catholic priest!”. Astrology is so awesome! Makes you wonder about free will. I asked her if she ever had a relationship with a man who she put on a pedestal and worshiped (to a fault). She looked at me in amazement and said, ” Years ago, I had a long term relationship with my Catholic priest!”. Astrology is so awesome! Makes you wonder about free will. I have natal Saturn(ruling planet) in Pisces and so learning about boundaries has been a big lesson for me 🙂 I have a friend with Mars in Pisces and she is extremely compassionate and works in health care. I believe that this one male friend has moon in Pisces making him extremely sensitive to others’ energy. However, I think that is Venus and Mercury are in resolute Capricorn and those 2 planets help to keep him firm and grounded. I can see that . . . and we usually don’t escape Saturn’s lessons either. I believe that this one male friend has moon in Pisces making him extremely sensitive to others’ energy. However, I think that his Venus and Mercury are in resolute Capricorn and those 2 planets help to keep him firm and grounded. Yes, having planets and/or an ASC in earth is wonderfully grounding. Water & earth interact harmoniously to his benefit and the benefit of those he cares for.